Notifications and other app-generated emails are critical to SaaS success. But operating email infrastructure is a difficult, time-consuming distraction from building great products. SparkPost makes it simple for teams to implement notifications and other product emails with reliability and security your business can count on. Email is difficult to scale, and building and maintaining it requires specialized operational skills. That’s one reason 28% of all email is undelivered or lost in the spam folder. Even worse, unsecured email is today’s primary vector for phishing attacks. That’s a risk your business can’t afford. 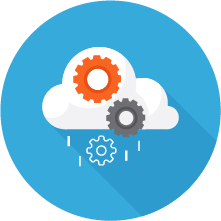 SparkPost delivers unmatched uptime and resilience, backed by SLAs with teeth. 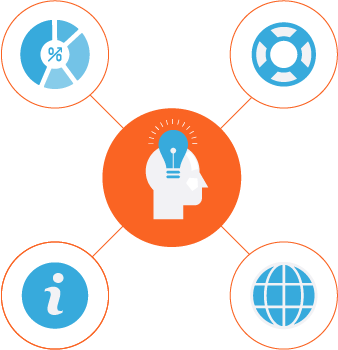 Our enterprise guarantees go deep, covering the SparkPost web app UI, data feeds, webhooks, and even business continuity. SparkPost customers see 96% of their email delivered on-time to user inboxes. That’s better than any other email delivery service. Our deliverability team proactively works with ISPs and inbox providers to resolve issues, so your email gets through. Immediate, on-demand capacity delivers real-world performance when it counts. You’ll see the same low latency—less than 2 seconds in transit—whether you’re sending 100 messages or a billion. And SparkPost’s burst-rate SLA can guarantee more than 10,000 messages per second. Rigorous security controls and email authentication reduce the risk of phishing attacks that impersonate your app or use insecure infrastructure as a beachhead. Certifications include company-wide SOC 2 Type 2. Europe’s General Data Protection Regulation is a major email concern. SparkPost is Privacy Shield certified and will be GDPR-compliant when the law takes effect. And for maximum confidence in GDPR needs, we offer optional EU-based data centers. No one understands scaling email like our email infrastructure professionals. Our dedicated deliverability and site reliability engineering (SRE) team ensures you can keep sending and receiving email 24 hours a day, 365 days a year. In this SparkPost Academy article, learn the essentials to API-centric product strategies that drive software development. 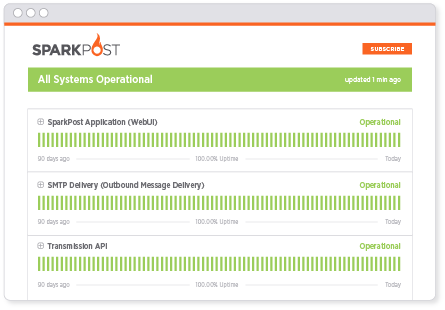 Get a real-time report on SparkPost system status and uptime.